Soup season is here, everyone! And I had yet to make a chicken noodle soup recipe that I liked (a couple ill-fated attempts in the past resulted in ridiculously bland, giant batches of soup). 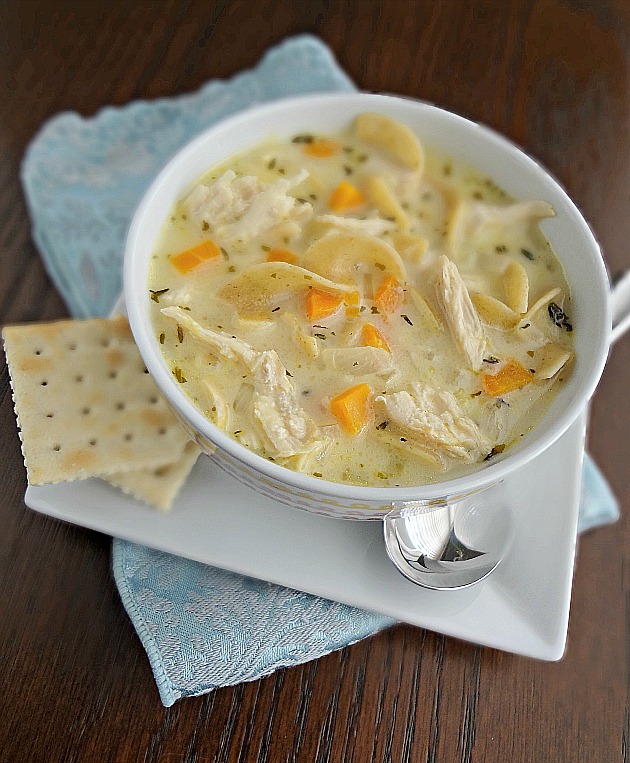 Sure I had a chicken and potato chowder that I was (and still am) obsessed with, but we all need a simple chicken noodle soup recipe in our repertoire, no? Yes! And this turned out to be the perfect one. 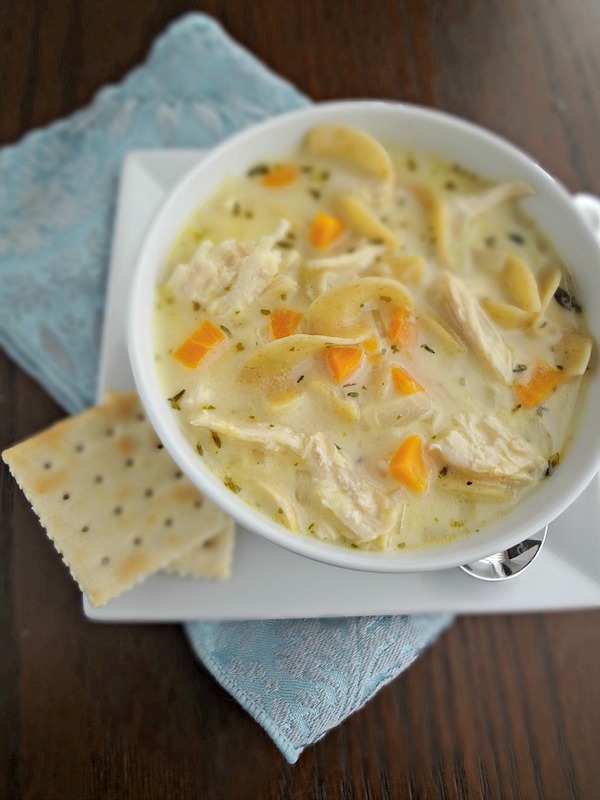 Michael and I both prefer heartier soups, so the fact that this is a creamy chicken noodle soup helps add to it. And if you're concerned about your waistline-don't be! 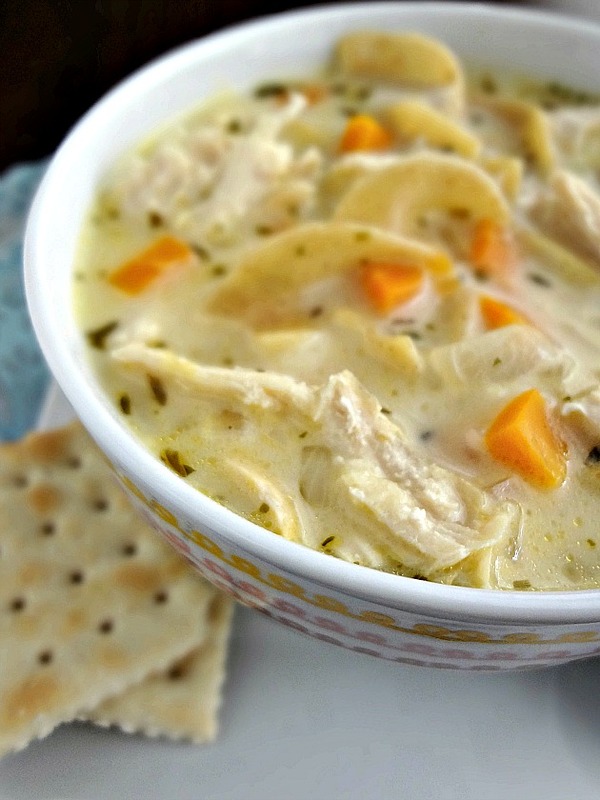 The creaminess comes from fat-free evaporated milk, so you can have your soup and eat it too! It's comforting and classic and I know we're all going to be happy to have this when someone inevitably comes down with a cold* (or at least if we come home after a chilly day and need something to warm us up the way only soup can!) And it's actually pretty quick to make! Soup for everyone! *Fingers crossed nobody gets a cold...ever. Heat oil over medium-high heat in a large pot or Dutch oven. Saute onion, carrots, and celery until soft-about 7 minutes. Sprinkle flour over vegetables and stir and cook for another minute. Slowly stir in the broth. Bring to a boil. Cover or partially cover the pot, reduce heat. and simmer for 10-15 minutes. Stir in chicken, noodles, evaporated milk, and seasonings. Cook about 10 minutes, until the noodles are finished cooking. Taste and add more seasonings, if needed. Big old bowl of comfort, right there.